Oof. This day had to come eventually. You may have been dreading it, but it was inevitable. It's the day that your child looked at you with those adorable, puppy dog eyes and tells you that he doesn't want to wear a cute costume anymore. Now, he wants to be something scary. Not just any old scary costume... he wants to be a clown. You know, a clown! They're those nightmarish beings that slather paint on their face, style their hair like some kind of villain, and laugh maniacally at the misfortune of others. Just the very thought of dressing a kid up in a clown costume makes us shudder a bit, but there comes a time when you have to let a child express himself. If he wants to be a freaky clown, then, gosh darn it, it's time to dress him up in this Evil Nightmare Clown Costume for kids. 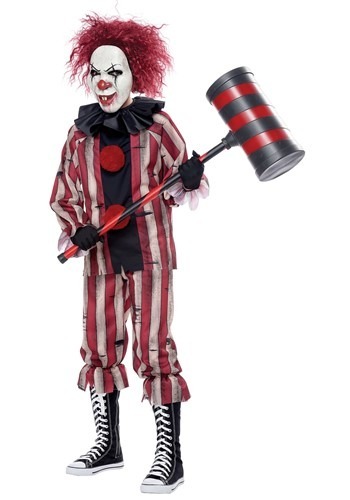 This super-creepy costume helps your child achieve his goal of being the freakiest clown around. Don't let those red puffs fool you! That red and white striped shirt has ragged edges and a faded look that screams killer clown. The pants help solidify the scary vibe, and the black collar has a macabre circus style. Pair that with the included mask and your child should be giving you nightmares for weeks to come when he wears this terrifying outfit. Sometimes, you don't choose the clown life. The clown life chooses you. If the clown life happens to choose your child, then you just have to roll with it. You might have to help him apply some face makeup or get him a new wig to match his new creepy persona. Just know that even creepy clowns need a little help to live it!